"The HP ProBook 6560b is a new business class notebook from HP which features the latest Sandy Bridge processors and a new bead blasted aluminum cover that delivers an impressive look and feel as well as adds to the durability which is enhanced by a magnesium reinforced ABS chassis." The merging of consumer and business notebooks continues unabated with the rugged ProBook 6560. While it looks fairly bulky (at a starting weight of about 5.5-pounds), the beveled bottom edge is a nice design touch, and quality components abound. The newest Sandy Bridge processors keep things running smoothly under Windows 7 64-bit professional, and HP includes a collection of business-class software tools that actually can be used, and are not necessarily part of the usual startup 'delete bloatware' task. The spill-resistant (but not backlit) keyboard with numeric keypad is great, and the touchpad is better than expected. Access to internal components on the bottom is absolutely easy - simply slide a button and the bottom can be removed for memory and/or drive upgrades, and, for cleaning the fan. Speaking of the fan, there is some noticeable noise, but not excessive. Sound is surprisingly good for a business-class system, and the 15.6-inch anti-glare display is quite good, with 1366x768 resolution standard. An HD display is said to be an upgrade option. A DVD/RW and a full complement of ports are on-board, but, surprisingly, no USB 3.0. Battery life is impressive, about 6-hours under testing, and 7-hours can reasonably be expected under normal usage. 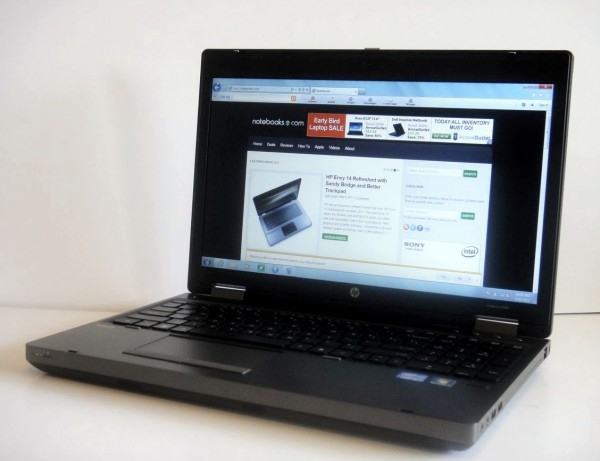 At a starting price of $899, the ProBook 6560 is a good lower-priced alternative to HP's more expensive EliteBook line.